So sorry I haven’t been able to post the last couple days!! My days are all off now because I have been sick. This is a crazy week in general and of course I get sick haha. Anyways, I HAD to get a post up today and share with you a couple pieces from a boutique that I recently received. All these pieces are non-maternity. As you guys know, I really try to keep all my pieces I share non-maternity….not because I won’t wear maternity but just because I think some maternity clothes can be so maternity looking haha. These pieces are from Chicory Lane Boutique. They just released some fall pieces and I am swooning. I love supporting small businesses. This first top is a fall must-have. It is a big boxy and oversized (which I love) but I sized up to a Medium. I probably could have gone with a small but the medium works too. The material is a soft flannel and I love the frayed edges. This is perfect layering piece! 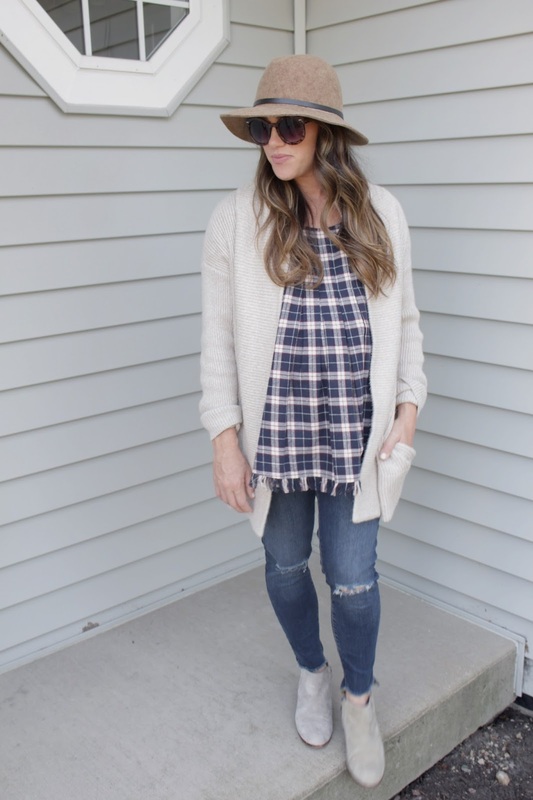 I have so many ways to style this but my favorite is just throwing a chunky cardi with it! I also love this top. This fall sleeve detail is everything…well sleeve detail has been everything for a long time. So I love this top wear you have detail around the hem of the shirt. It gives interest and also pairs amazing with leggings! !